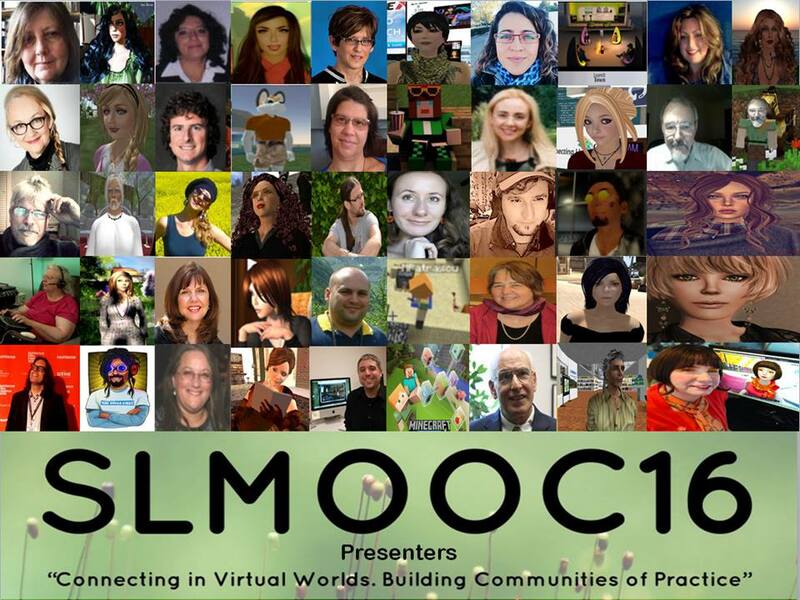 On Sun Apr 24 #EVOMC16 held a SERVER PARTY and presented Minecraft and the gamification of teacher and student learning at the SLMOOC16 annual online conference. Panelists Jeff Kuhn, Linda Gielen, Mircea Patrascu, Rose Bard, Robert Ogorek, Anna Jedryczko, and Vance Stevens will demonstrate through screenshare in Adobe Connect some of the work they have done on the EVO Minecraft server maintained by Aaron Schwartz at Ohio University. 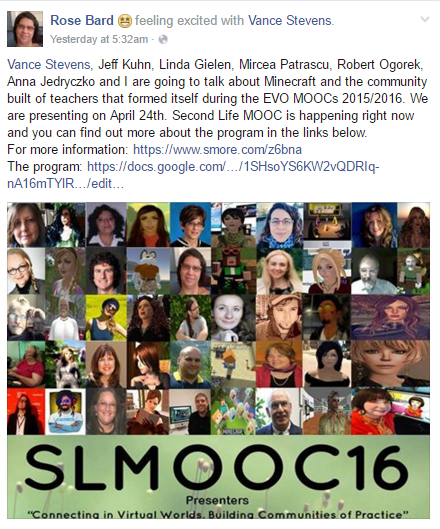 Panelists will also show how they use Minecraft for work with students in their own Minecraft virtual spaces. 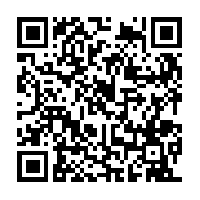 Sign in with as a “guest”, enter your name and you’ll be able to see the Edmondo presentation. Edmondo, the Italian educational Open Sim will be presented, highlighting the latest training experiences relating to English language and methodological courses carried out with Italian teachers and still ongoing. This presentation is pitched at teachers of young students about how to put yourself in the mind and body or at least avatar of a young learner and get in the game of Minecraft and try and figure out what all the fuss is about through experience with other teaching peers occupying similar avatars. 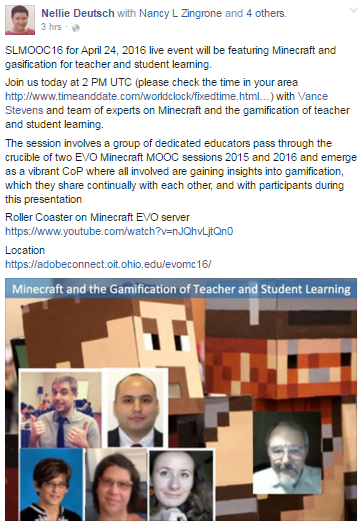 Vance Stevens will begin by briefly introducing the EVO Minecraft MOOC Google+ Community https://plus.google.com/u/0/communities/112993649763396826671. This is a community established as an EVO (Electronic Village Online) session. It was designed to attract participants knowledgeable in Minecraft who could help newcomers to Minecraft, a.k.a. noobies, to become functional in the game and better understand how they could use it in their educational settings. Two of the strongest contributors to this community with respect to young learners have been Mircea Patrascu and Rose Bard. Each plans to spend 10 to 15 minutes showing us via screen share what they have built in Minecraft that can help young learners realize the potential of the environment for young learners when that learning is guided by practitioners skilled both in Minecraft and in working with learners. This combination of characteristics has become more and more common in educators as the affordances of Minecraft in empowering young learners becomes increasingly apparent and more widely known. 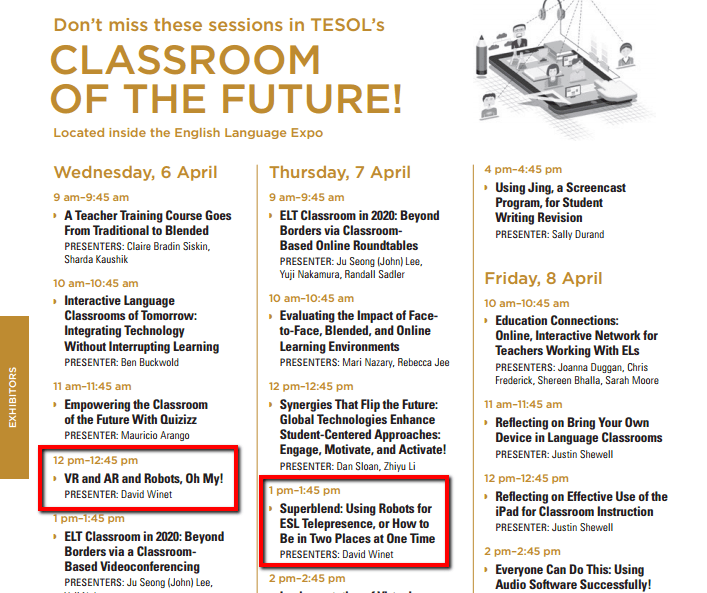 Wed Apr 6 Learning2gether with David Winet at TESOL Baltimore Classrooms of the Future – VR and AR and Robots, Oh My! Complaints about a supposed decline in standards of English continue to be made, with increasing frequency, in the British press. Although these are nothing new – as the long history of use of would of for would have illustrates – they do draw attention to the way we seem to be going through a period of unusually rapid language change. This paper illustrates the main changes in pronunciation, orthography, grammar, and vocabulary, discusses the chief factors involved – social mobility, globalization, and the Internet – and compares the changes that have taken place in the past fifty years with those that are likely to take place in the next fifty. …and why we still need to talk about this in 2016. It is often claimed that much has changed in the eld of English Language Teaching since 1983, when Peter Medgyes rst described the struggle of ‘non-native’ teachers for visibility and due recognition. But has it? Away from academic circles, where the discourses that equated the ideal teacher with the ‘native speaker’ have been interrogated and critiqued, how has the situation really changed for the professional teacher of English whose rst or home language is a language other than English? I will reflect on the impact of the native-speaker bias and its dominance on developments in English Language teaching methodology, and how this dominance seems to have affected the emergence of context-appropriate pedagogies. Finally, I will address the ‘second best’ view of the ‘non-native teacher’ and its impact on their own construction of a legitimate professional identity and on their con dence in themselves as teachers, users and experts of an-other language. 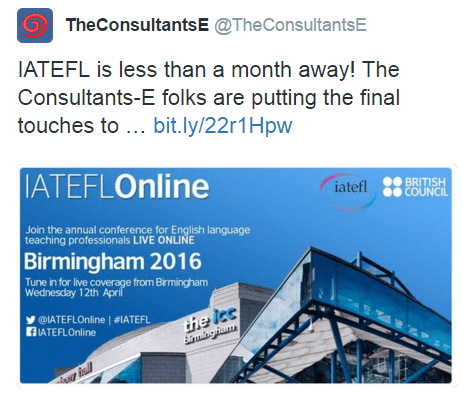 If you can’t attend the 2016 IATEFL Conference, follow the event online! Coverage will feature talks, sessions and recorded interviews with conference presenters and delegates. aka Eugenia Calderon in SL and DW. Go tohttp://www.digiworldz.com/and make a free account, create an avatar, download Firestorm or Singularity, choose DigiWorldz from the grid menu, and you’re in. Click on the World map icon at the bottom of your viewer, put “Escape” into the search bar on the World and then click “Find” and then “Teleport” and you’ll be there! The webinar will preview instructions to useful skills for teachers, SLURLs to great places to find teaching-related freebies and useful toys, organizing tips for keeping class inventories, as well as introduce folks to the searching on the Marketplace for teaching related tools. 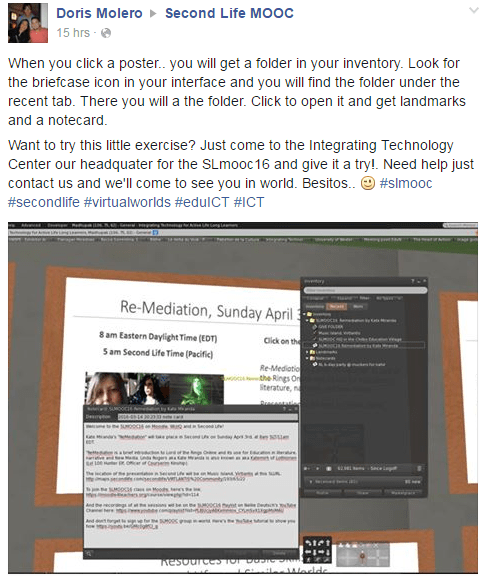 The workshop will include making display boards for links to helpful websites, or books, articles, making notecard givers for assignments, and setting up class/student subdirectories in your SL inventories. We chatted about what’s involved in webcasting from TESOL each year and where we might take it from here throughout the year, not just at TESOL conferences. And we talked about people’s experiences and suggestions for improvement on what we do. We’ll talk about how the event went, problems that arose, and successes of course, and what we might do to improve it next year. We’ll find out about challenges faced by those who worked to make it happen, who put themselves in the position of having to kickstart the technology while organizing and uploading powerpoints from numerous presenters, all in the ten minutes between presentations, and what motivates them to put themselves in that position. And I’m sure we’ll find out how much they enjoyed it and why they might convince others to give us a hand next year. In Jennifer’s case, where she used Bb Collaborate to webcast from a recent TNTESOL conference, we’ll talk to her about what brings her to webcasting, what motivates her to risk it despite the odds, and what her experiences were webcasting the recent TNTESOL conference, what she learned, advice for other webcasters. We announced the event on our TESOL list and cordially invited other CALL-IS webcasters from the just finished TESOL Conference in Baltimore to join us as well. All interested in finding out more about webcasting under the radar from international conferences worldwide are welcome to attend. 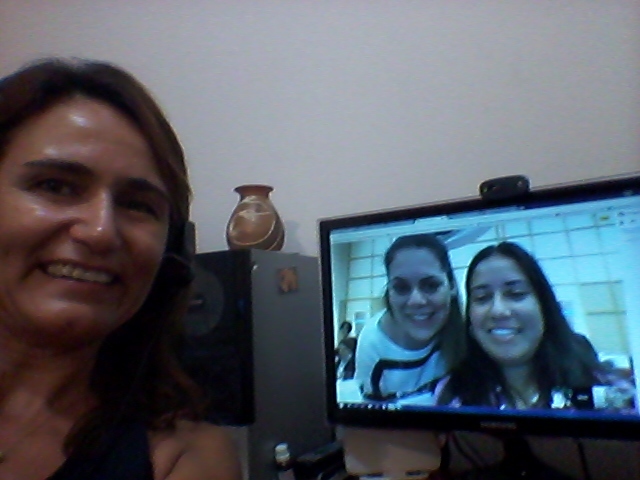 InterSection: ESPIS with VDMIS and CALL-IS: One size fits one: Incorporating technology into ESP courses. 1:00 – 2:45 pm EDT. The Learning2gether Blackboard Collaborate room was used on April 6, 7, & 8 for CALL-IS events being webcast from the annual TESOL Convention in Baltimore. This room is available on a long-standing grant from LearningTimes, http://learningtimes.com, to Learning2gether as an instantiation of Webheads in Action, and LearningTimes have kindly agreed to support TESOL CALL-IS webcasts through donation of two additional rooms as well, to support the need to run two Collaborate rooms at the same time for EV fair classics, and at 20 min intervals on other occasions throughout the conference. Be sure to “like” and “follow” the interest section before the conference to stay connected on social media. Use the hashtag #EVILLAGE2016 in your tweets to help promote the electronic village. 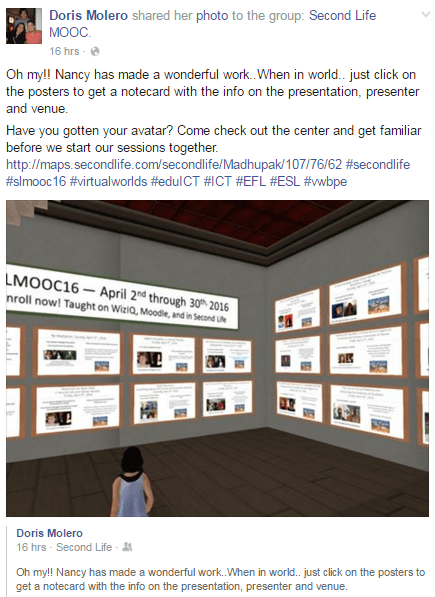 Wed Apr 6 TESOL Baltimore Classroom of the Future – David Winet on VR and AR and Robots, Oh My! Learning2gether with David Winet at TESOL Baltimore Classrooms of the Future – VR and AR and Robots, Oh My! 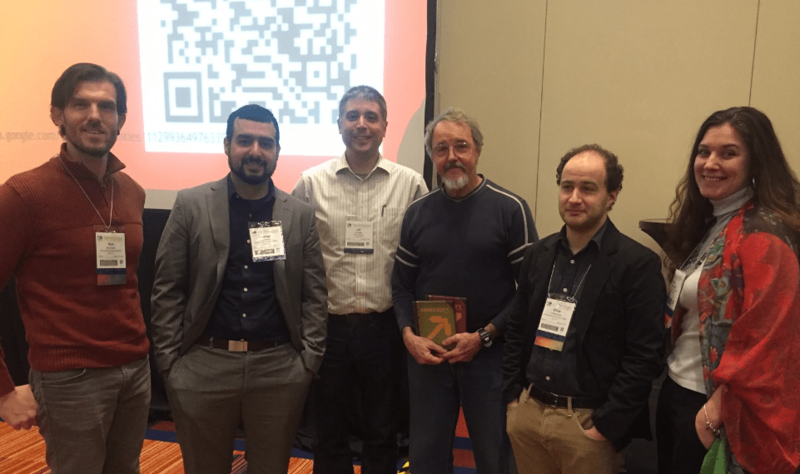 Dave Winet asked Vance Stevens to try and archive his talk at TESOL 2016. Ever pushing the edge of the envelope, Dave will attempt to get a robot to join his presentation (ironically bringing two entities into the same physical space at one time) whereas Vance will attempt to surmount bandwidth challenges to webcast the event via HoA. Join our fiasco or witness a seminal event, webcast from TESOL Baltimore. Anything can happen. Summary: Robots permit ESL “telepresence,” being in two places at one time. Students can learn and interact with people, places and things in faraway places or nearby. Robots allow teachers to extend the learning realm for students, generating interest and excitement. An actual robot will be in attendance at the presentation! Objective: To acquaint attendees with the idea of using robots, controlled through internet, to allow students to actually be in two places at once — the comfortable, safe classroom environment, and the exotic, exciting places a robot can visit. The attendees will see how this kind of McLuhanesque extension of ourselves leads to learning language and culture in a visceral, 100%-present kind of way. Attendees will be able to have a go at controlling the robots themselves, both inside the Convention Center and at great distances such as Paris, France, and will understand how students’ interest can be magnified by face-to-face contact with real people, places and things that matter to and intrigue them. Whether it’s by attending a regular university class, “visiting” Machu Picchu or Times Square in real time, or interviewing the man-on-the-street in Peoria, London or Mumbai, the use of robots will be seen to offer tremendous potential for learning language, understanding culture and participating in meaningful group experience with their classmates. I am requesting 45 minutes to explain to attendees how to: drive the robot, give participants a chance to try it for themselves, and use robots in different locales for different types of learning. The new 3-D virtual reality headsets are something like the 2-D virtual reality site Second Life but even more compelling and immersive for listening, speaking and reading at every level. Remote-control robots also offer tantalizing prospects for English teaching. Put together, they can create an effective enhanced-reality learning environment. Realistic 3-D “virtual world” environments using Oculus Rift, Google Cardboard and other headsets create an immersive environment for students to learn in a non-mediated, direct fashion not unlike the way children learn their own languages, but with the added educational benefit of “augmented reality” elements such as explanatory words superimposed on real-world settings and the ability to generate testing and competition within those environments, seamlessly connecting the real world, imaginary worlds and ESL tasks all in one. Personal robots, another emerging technology with educational potential, allow a learner or a whole class to experience “telepresence,” that is, the ability to be in two places at once, for example, in a classroom in Peoria and inside the Coliseum in Rome, able to move around in real time, communicate with real people in a faraway place, and, with the addition of “augmented reality” elements, to use those experiences for language acquisition. Pairing 3-D headsets with robots can take the immersive educational experience one step further by obviating the need for a smartphone or mouse for navigation and just allowing natural body movements like head-turning and walking to inform the learning experience. Participants will try out VR headsets during the presentation. If you are available, please join us on the server and/or in the adobe connect session so you can interact with other teachers and CALL professionals and demonstrate our community in action! The tech fair was scheduled for 1:30pm to 2:30pm EST…that’s 5:30-6:30pm UTC. If you participated in our Remind.com webinar last year you are probably already convinced about how valuable this tool is for strengthening home/school communication. There have been some great new updates to Jordan Pedraza and a panel of teachers and administrators return to share these updates. Joining her on the panel: Michael Buist, 5th Grade Teacher at Knox Gifted Academy in Chandler, AZ (@mrsjeff2u);; Joe Oliphant, Co-Principal and Former 2nd Grade Teacher, Propel Braddock Hills High School, Braddock Hills, PA (@Joe_Oliphant). Remind helps school communities deepen relationships and engagement through instant and safe communication through text and mobile app messages. Better communication leads to stronger communities and improved outcomes. Teacher-parent engagement is critical to student success, and Remind helps connect these support networks with simple, accessible messaging. In this webinar, we’ll share how educators use light-touch communication to extend student learning, increase parent involvement, and strengthen relationships in their classrooms and schools. Jordan Pedraza currently leads Community at Remind and has worked in the ed tech space for almost 10 years with experiences in higher education, k-12, policy research, and international settings. Before Remind, Jordan led Community with Google for Education and helped universities, k-12 schools, and ministries of education adopt various Google tools. Jordan is deeply passionate about helping communities explore and adopt technology for new learning models and creativity. On the Classroom 2.0 LIVE! site (http://live.classroom20.com) you’ll find the recordings and Livebinder from our recent ”Global Google Mapping” session with Kathy Beck. Click on the Archives and Resources tab. Please join our free Designers for Learning webcast tomorrow as part of ourinstructional design service-MOOC. We will be reviewing our progress as we reach the mid-point of the 12-week MOOC. Over 1,300 participants have enrolled in the free and open course that centers on the design and development of open educational resources (OER) for adult basic education (ABE). In this project-based MOOC, participants are networking and gaining instructional design experience while developing instructional materials that will be made available for free to adult educators and learners in the Adult Learning Zone group on OER Commons. Dr. John Baaki will host our conversation. In addition to a few of our course facilitators and subject matter experts, we have assembled a small panel of participants from this course who will share their perspectives as educators working with our target audience of adult learners, including Ruth Sugar, Patricia Hernandez, Alfons Prince, and Magxina Wageman. As in past webcasts, course participants are asked to please post your questions or comments before the webcast in our Ask a Subject Matter Expert forum, or live tweet questions and comments during the webcast using the #openabe hashtag on twitter. We have had so many great presenters on Classroom 2.0 LIVE sharing the ways they use technology in their classrooms to support learning. In almost every webinar questions come up about issues related to copyright and fair use. We are excited to be able to get some background and answers to our questions in this week’s webinar with our special guest presenter: Dr. Royce Kimmons. We hope you will plan to join us for this valuable information! Dr. Kimmons is currently an Assistant Professor for Instructional Psychology and Technology at Brigham Young University. He specializes in social networking, teacher education, technology integration, professional development, web applications and game development. More information and session details are at http://live.classroom20.com. 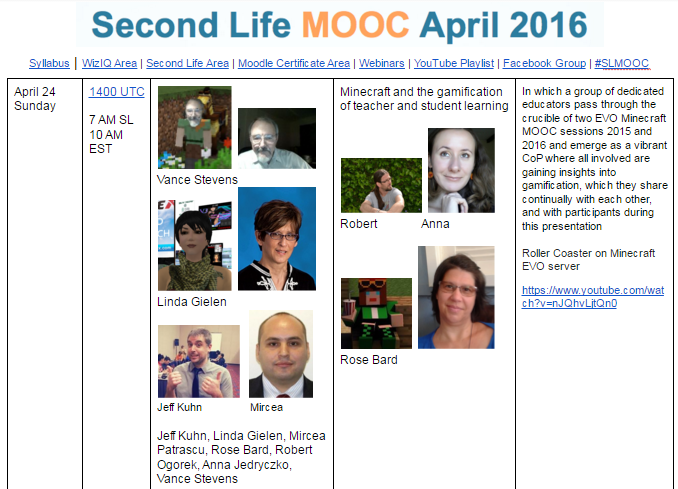 If you’re new to the Classroom 2.0 LIVE! show you might want to spend a few minutes viewing the screencast on the homepage to learn how we use Blackboard Collaborate, and navigate the site. Each show begins at 12pm Eastern (GMT-5) and may be accessed in Blackboard Collaborate directly using the following Classroom 2.0 LIVE! link at http://tinyurl.com/cr20live. All webinars are closed captioned. On the Classroom 2.0 LIVE! site (http://live.classroom20.com) you’ll find the recordings and Livebinder from our recent ”Fostering Learning, Engagement and Community with Remind” session with Jordan Pedraza, Community at Remind, @JordanPedraza; Michael Buist, 5th Grade Teacher at Knox Gifted Academy in Chandler, AZ (@BuistBunch); Carla Jefferson, Instructional Technology Coordinator, Darlington, SC (@mrsjeff2u); Joe Oliphant, Co-Principal and Former 2nd Grade Teacher, Propel Braddock Hills High School, Braddock Hills, PA (@Joe_Oliphant). Click on the Archives and Resources tab.